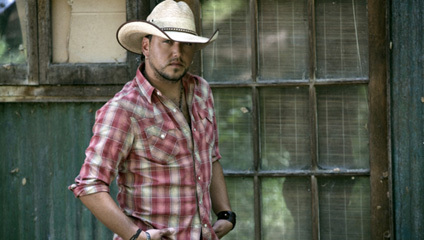 Country vocalist and guitarist Jason Aldean was born in Macon, GA, in 1977. His parents separated when he was three years old, and he spent his childhood with his mother in Macon through the school year at a time of spending the summers with his father in Homestead, FL. He fell early under the spell of country songs and made his first public appearance as a vocalist at a VFW hall in Macon when he was 14 years old. Soon he was a regular at area talent contests, and a year later he joined the house ensemble at Nashville South in Macon. Aldean began pursuing a material career on a full-time basis not long after his graduation from high school and, with his father as a booking agent, was soon gigging in college towns throughout the Southeast and up and down the Eastern Seaboard. Aldean privately financed an eight-song CD at a time of this period to sell at shows, recording it in Nashville in 1996. Michael Knox spotted Aldean at an Atlanta showcase a year or two later, and signed the vocalist to a songwriting record deal with Warner-Chapell Publishing, which allowed Aldean to move to Nashville in 1998. When a couple of recording deals fell through and his songwriting contract was about to expire, Aldean was on the verge of giving up on the songs business when he drew in the attention of the independent label Broken Bow Records, which issued his debut album, simply called Jason Aldean, in 2005. Aldean came back to the studio in January 2007 to work on his follow-up release, Relentless. The album, featuring the single “Johnny Cash,” hit stores in May. 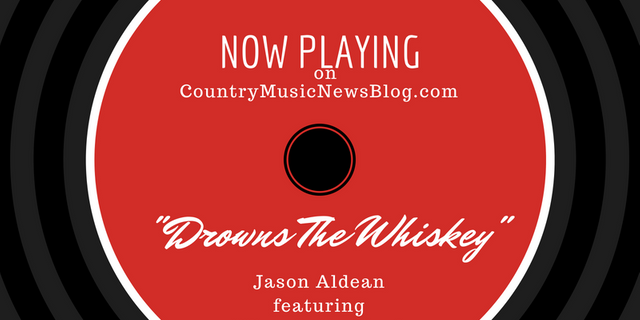 Just in time for the launch of his High Noon Neon tour, Jason Aldean is taking over the airwaves with a little help from good friend Miranda Lambert on this new track “Drowns The Whiskey”. Take a look and listen to the brand new lyric video and tell us how you like it! Just in time for the weekend, Jason Aldean hits us with a heartwrenching love anthem in his new track “I’ll Wait For you“. Give it a listen and let us know what you think! You can catch Jason Aldean on the road this summer with special guests Luke Combs and Lauren Alaina on his High Noon Neon tour! Tickets are on sale now at all Ticketmaster locations! SUNDAY night’s (11/12) “COUNTRY RISING” concert in NASHVILLE, benefiting hurricane relief efforts and victims of the LAS VEGAS shootings, raised more than $4 million, according to organizers. The evening featured Country’s biggest stars, such as GEORGE STRAIT, JASON ALDEAN, DIERKS BENTLEY, SAM HUNT, LADY ANTEBELLUM, CHRIS STAPLETON, REBA MCENTIRE, MARTINA MCBRIDE, and KEITH URBAN, among others. Additionally, recently crowned CMA Entertainer Of The Year GARTH BROOKS sent a video greeting from his show in SPOKANE, WA announcing he’d donated proceeds from the concert to the relief effort. The fundraising effort continues, with fans able to give by texting “NASHVILLE” to 41010, donating online here, or purchasing concert merchandise here. All proceeds raised will go toward the COUNTRY RISING fund of THE COMMUNITY FOUNDATION OF MIDDLE TENNESSEE. CMT will honor victims of the recent devastating hurricanes, and the SUNDAY, OCTOBER 1st mass shooting in LAS VEGAS, by transforming its “CMT ARTISTS OF THE YEAR” special into a night of hope and healing. The eighth-annual special will air live from NASHVILLE’s SCHERMERHORN SYMPHONY CENTER on WEDNESDAY, OCTOBER 18th at p (ET). CHRIS STAPLETON, FLORIDA GEORGIA LINE, JASON ALDEAN, KEITH URBAN, and LUKE BRYAN will be honored during the show, and will be joined by ANDRA DAY, LEE ANN WOMACK and LITTLE BIG TOWN, who will open the show with a performance of “Rise Up.” Additionally, DAY, LITTLE BIG TOWN and COMMON will perform “Stand For Something.” “Given the devastation of Hurricanes HARVEY, IRMA, and MARIA, and the mass shootings in LAS VEGAS, we feel a commitment to our fans to address all of the tragedies not in one somber and solemn moment or segment, but rather devote the entire evening to uplifting the fans through high-spirited music,” said CMT/TV LAND GM FRANK TANKI. “Both ‘Rise Up’ and ‘Stand Up for Something’ are inspirational anthems that perfectly sum the message for the evening. The special has always been a place where artists from different genres can stand side-by-side, and now more than ever, we want to showcase the power of unity and resilience through music.” CMT says this year’s ceremony will forgo the formal presentations of awards and speeches in favor of heartfelt messages from the honorees directly to their fans. 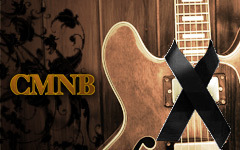 In addition, CMT has assembled the entertainment community to share messages of hope and healing. Additional performers will be announced at a later date. CUMULUS Country WFMS/INDIANAPOLIS used their time with BROKEN BOW RECORDS artist JASON ALDEAN just before the “52ND ACADEMY OF COUNTRY MUSIC AWARDS” to ask a favor — not for the station, but for a young listener. The WFMS crew asked ALDEAN to assist a local high school junior with his “promposal,” and ALDEAN happily obliged. “We asked the Entertainer Of The Year for a favor at the ACM broadcast, and JASON delivered,” WFMS morning co-host DEB told ALL ACCESS. “More importantly, ASHLEY said yes!” See ALDEAN’s video promposal from GRIFFIN to ASHLEY here. Congratulations 2017 ACM Award Winners!